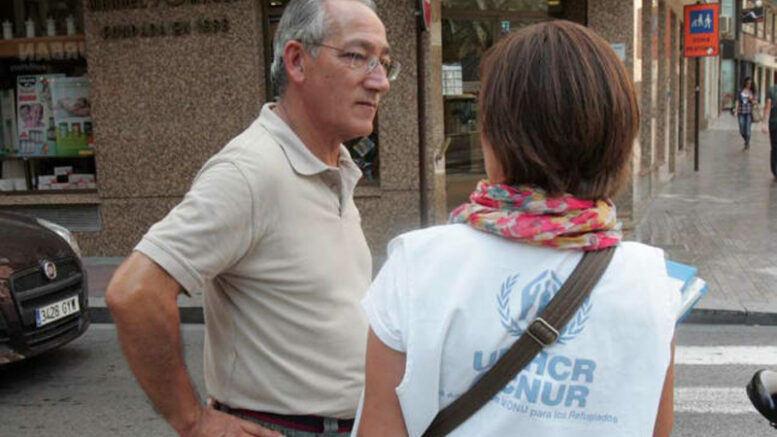 The highest court in Spain’s central region of Castilla-León has ordered non-governmental organizations (NGOs) and non-profit associations operating in Spain to stop classifying employees who work in public places soliciting support for their organization as administrative assistants so as to pay them a significantly lower wage than they are due for the type of work performed. The ruling last month by the Supreme Court of Justice of Castilla-León, which has just taken effect after a 30-day period for appeal lapsed with no action taken by non-governmental organizations, means that individuals employed by NGOs to canvas the public for petition signatures and donations must now be paid at the higher-minimum wage rate corresponding to salespeople in Spain. For part-time NGO canvassers, the increase in pay will represent as much as 300 euros per month in additional income; for full-time NGO canvassers, the court decision could bring them additional income of as much as 1,000 euros per month. The court order is the first of its kind in Spain and is seen as setting a precedent that will help end the scandalously low pay of employees of charities and development organizations frequently seen in public soliciting support for their organizations from passersby. NGOs working to try to make the world a better place employ an estimated 645,000 people in various capacities in Spain. Sustained austerity cuts to federal budget support for NGO work domestically and overseas begun in 2012 under the former conservative Partido Popular (PP) government of President Mariano Rajoy forced many Spanish and international NGOs with offices in Spain to slash operating budgets, lay off employees and try to generate income from other sources — including the general public, through stepped up solicitation efforts employing low-paid workers canvasing in public places. Spanish labour unions have denounced the low page of the NGO solicitors for years, pointing to the ruse of paying them a lower monthly wage as administrative assistants. The NGO canvassers, they noted, frequently work long hours, under difficult conditions on public streets and in all kinds of weather, under precarious short-term contracts that mean they do not know from month to month whether they will continue to have a job.